The implications of poor reading skills are well-known and well-documented, affecting every aspect of adult life. Why do students show reading declines in middle and high school (even if they are fine elementary readers)? A strikingly high number of reading problems are not discovered until middle school, by some estimates as many as 50%. The reason? 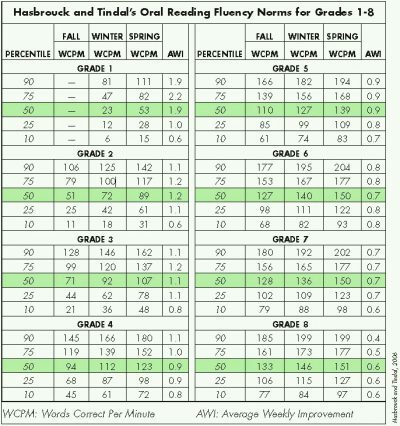 Reading fluency, as measured by correct words per minute, is expected to increase steadily through 8th grade. However, many schools stop measuring fluency for proficient readers in 3rd grade. As a result, schools often do not realize which students’ reading scores are starting to lag behind. What they don’t know, they can’t address. In addition, many schools don’t provide structured reading comprehension instruction. As a result, some students who can “wing it” through elementary school don’t know how to take the deliberate approach needed to comprehend longer and more complex texts. Of course, reading comprehension and reading fluency often are just the symptoms of other underlying needs. How can schools anticipate which students will need reading help? One important thing schools can do is continue to formally assess reading fluency skills through middle school. Use fluency scores along with standardized reading comprehension assessments to identify at-risk students, even if class grades are fine. Better still, schools can go beyond traditional reading assessments. When elementary readers struggle, the response is often to address the reading score deficit but not the underlying cause. That gives students a short-term proficiency boost, but the problems can re-appear in higher grades. When schools assess and address underlying cognitive needs (e.g. executive functions, memory, and processing using a cognitive screener) they are more likely to have long-lasting impact. What type of reading support is best when reading difficulties emerge in late elementary or middle school? If you guessed “it depends” you’re right. Delayed reading challenges can be even harder to understand than those that appear early. Often this is because students have cognitive asynchronicities, i.e. relative strengths in some skills and weaknesses in others. In elementary school, the strengths can mask weaknesses, but in middle or high school the differences become apparent. There are also environmental and developmental reasons, such as changes in vision or emotional difficulties. Or their cognitive skills might not be developing as quickly as their peers. Once you understand the underlying cause of a decline in reading scores, the needed supports will become more apparent. How do I identify the underlying cause? Is your student having difficulty only with longer texts? Are short texts also challenging? If your student does fine with shorter texts but longer tests are problematic, the problem might be rooted in executive functions or memory—not necessarily a reading problem. Your student might be tiring too easily and accuracy drops off. If shorter texts are a challenge, you will want to evaluate verbal reasoning skills. Is your student having difficulty only with non-fiction? Fiction? Only with certain topics? Students with weaker attention have trouble staying focused if they aren’t inherently interested in the topic. You might be observing an attention problem, not a reading problem. If the difficulty seems to be only with non-fiction, consider if your student needs help with subject-specific vocabulary. Your student also might have weaker abstract reasoning skills. Weaker abstract reasoning might not impact reading comprehension performance until students reach middle school where they need to rely a lot more on inferencing skills, and there is a greater emphasis on non-fiction texts. Are reading fluency skills weaker than reading comprehension? Students who struggle with fluency often stop reading because reading always takes them longer and they get discouraged (even if their comprehension is fine). Over time, their comprehension skills might suffer because they read less. The reason for poor fluency? It could be as simple as your student needs glasses. If you are still noticing letter and number reversals in late elementary or middle school, it could be something that requires more intervention. Assessing your student using a ‘nonsense words’ screener will be important. If you’re working with elementary students, consider if they lack automaticity with sight words. While that could be a problem stemming from weaker memory skills, it is a problem that lots of spaced practice can help. Fluency and comprehension develop cumulatively over time—students with weaker verbal memory might not be growing vocabulary at the same rate and need extra vocabulary reinforcement. What other subjects are difficult? Over time, reading deficits will undoubtedly affect all subjects—you need to read your textbook in science class, understand word problems in math class, and follow written directions in art class. However, if students are showing inherent difficulties in other subjects, those overlapping difficulties can give you some insight into the root(s) of the problem. If your student is also experiencing fluency difficulties in math, you might want to evaluate spatial reasoning, memory and processing speed which are skills likely to affect reading and math. When the student shows inconsistency across subjects, you will want to evaluate executive functions. If students are very distracted or anxious, they might find it hard to focus. It might look like they don’t understand, when the problem is that their head just isn’t in the game. If a student shows a sharp decline in performance, check their emotional well-being. The connection between emotions and learning can be significant. Also consider the converse. Students who are struggling to learn might feel anxious. Or they might act out rather than admit that they are having difficulty. Your “class clown” might really be a student who has been struggling to learn. And it is true that many students with learning differences also have emotional diagnoses. It can be complicated. A student who is not ready to learn, probably won’t learn very much no matter what instruction you provide. The following links provide valuable additional resources to help you understand and support reading challenges. If you are eager to move ahead on assessing underlying cognitive skills, you can access our online cognitive screener for quick results; schools can contact us here. Learning Differences & Emotional Needs: A list of non-profit sites that support schools and families with learning concerns, many reading-specific. Reading Strategies: Our free collection of 70+ evidence-based reading strategies for use at school and home.